The Creswell AWOS is in service! The Creswell Hobby Field (77S) AWOS is now available by calling 541-895-2349 or by listening on 119.275 MHz! Hooray!! Complete the EAA Youth Protection Training and background check. PLEASE bring a copy of your completion of same to the Young Eagle event at Creswell Airport on the 4th of July. Pilot is current – medical, BFR, Flown recently to carry passengers, etc. Last year we flew over 100 young eagles and had to turn some away, so we need as many planes and pilots as possible. how late you are willing to fly. Tom Cunningham’s “Firestar” will be in the 4th of July parade promoting EAA 31 and Young Eagles flights later that day. We NEED a tow vehicle. The plane and trailer together total around 800 pounds. A riding lawn mower or small pickup could do the job. It seems that the last several years I have become the unofficial organizer of the subject flyover and I’m willing to do it again this year. We like to have, typically between five and eight airplanes. While any aircraft are welcome, we have generally preferred planes a little different from the standard Cessnas, Pipers,etc. I got a note from Joe May the other day saying he has completed and is flying his RV6 and would like to participate in the flyover. So far we have him and me with my RV6A. So, that two. Another three to six planes would be nice. We’ll meet on the ramp a little after 10 a.m. for a safety briefing, and plan to takeoff a little before 11:00 to make our first pass over the parade route right at 11:00. If you’re interested in participating, please call me at 541-914-8605 or send an email to RV6AN200GL@CHARTER.NET. The dinner portion of the meeting started at 6:00 PM hosted by Virgil and Bridget Pratt. There were Costco Hot Dogs, great hamburgers, lots of Bridget’s famous Chili, brownies, chips and a drink for only $5. Don’t miss her next great meal!! The meeting started with the pledge of allegiance at 7:00 PM sharp. President John Kuehl, VP Bill Johnson and Secretary/ Treasurer Randy Stout were present. The business and entertainment portion of the meeting was called then to order. There were 21 members and 7 guests in attendance. The guests included (forgive me for the omissions of names, as the intros came fast and furious!) Patrick, a U of O almost Grad with an aviation interest, Dennis and his wife, who own a Citabria and Pacer and are working on building a Bearhawk Patrol, and a mom from Creswell with her 3 (very interested in aviation) kids. Welcome to all!! Next Chapter breakfast is Saturday, June 18th. Come out to the clubhouse in the AM and pay $5 for an “all you can eat” breakfast of eggs, bacon, sausage, pancakes, OJ, coffee and camaraderie!! Starts at 9:00 and runs to about 10:30 or so. Bridget did not mention whether or not she can be here so our volunteers for this breakfast are (hopefully) the same group as last time Tom, Bill, Rod and John, who will coordinate getting the breakfast ready to serve. Thanks in advance guys! The old business was called for and the first item consisted of a list of members who have not yet paid for 2016, which was given to Doug Kindred to follow up. In addition, the Secretary displayed a nice certificate from the “Rosie The Riveter” group, thanking us for the time we spent with them. Of course, it is we who should be thanking them. This certificate is now posted on the clubhouse wall. Tom Cunningham brought up the upcoming “Wings and Wheels” show at Cottage Grove on the 25th, and had sign up forms for anyone who is willing to come and display their aircraft (or presumably their car). He left the forms at the front table. Gary Ludeke took the floor and asked for some volunteers to help finish the RV-3 project in the back of the clubhouse. He and Alan Weider have a list of very do-able projects that need to be completed ASAP. He got several offers of help (Tom Cunningham, John Kuehl), and is hopeful that we can complete the project this summer. Kyle has offered to let them use the paint booth for the final painting. Frenchie invited the group to consider a trip over to the (newly remodeled) Oregon Air and Space Museum at the Eugene Airport. President John then told the group that unless we designate a YE coordinator, we will not have any YE flights on the 4th of July. Rod Johnson stepped forward and offered to man this important position. Thanks Rod!! There being no other business, President John began the Chapter Video from EAA National. After the video, President John introduced our speaker for the evening, Gary Brown. Gary has been flying for 42 years. He has over 32,000 hours. 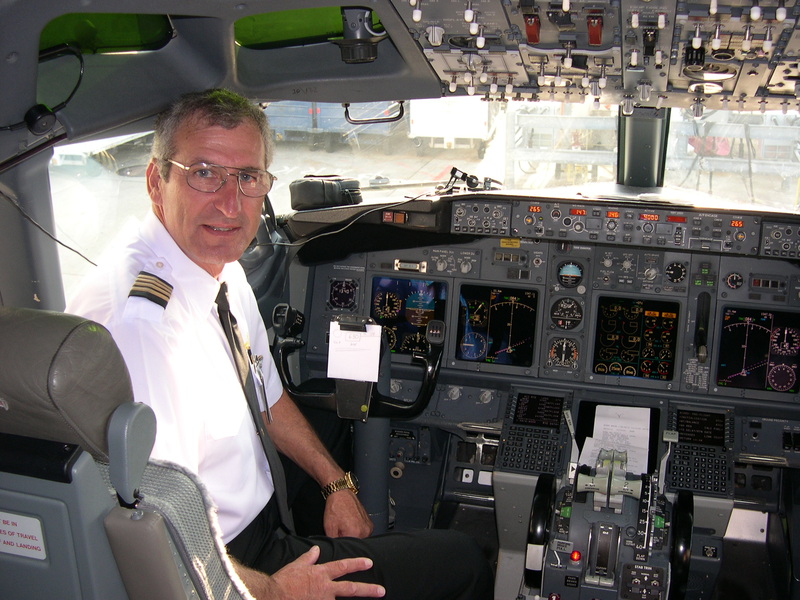 He flew for Continental Airlines for 25 years and currently spends time as a DAR (Designated Airworthiness Representative). He gave a very interesting presentation on his career, and his post career flying, along with some pictures of the big boys having the same kind of problems that us little airplane flyers sometimes have. He was warmly thanked for his time and very entertaining talk. His departure was a real crowd pleaser! !